There used to be a segment on NPR’s Morning Edition called This I Believe with Jay Allison. I didn’t like that segment because it was full of sappy stories, much like the Family Circle magazine that is now showing up in my mailbox…(Thanks, Martha Stewart for going digital with Whole Living and making a deal that made that happen). These days our beliefs are plastered on everything from our cars to our Facebook pages. Growing up in a christian environment, your beliefs, or non-beliefs, as are mine these days, were kept to yourself and not so readily shared. That said, I DO believe that it is a good thing to help others, to donate and help our community thrive by sharing what we have with those less fortunate or struggling. These days there is a lot of this and it makes me feel good to share when I can. As an artist, I get asked to help out causes all the time. And as we draw 2013 to a close, I have been thinking about this notion of being asked to donate my work. I can claim the donation on taxes but I don’t get the retail value. And my bank account doesn’t grow like I would love to see. There is even a Facebook group called Stop Working for Free that I joined to see how other artists deal with pleas for free work. I have read numerous articles where artists are told not to work for free. I’ve even read articles where people think that artists should expect to work for free and not feel that we are “entitled”. As a young artist, we get told that by doing a freebie for someone will give us exposure and help our careers. I have to say, that as an “older” artist, this has been the case for me locally. I don’t ever expect to be a famous artist but, after losing my job to the internet, and having to fall back onto my artistic talents, I am happy to say that some local exposure has been helpful to my new career. But at the same time, I still get frustrated when I am asked to give a donation for a cause. Especially if the cause is something that I don’t believe in. For example, I was asked recently, because I do rabbits, to donate a piece of my work to a rabbit rescue…..in CALIFORNIA. Uh, rabbits are food….. and a silent auction to save rabbits from someone that decided they didn’t want them anymore, to me is not a worthy cause for me to donate my long hours to. And to ship it to the opposite coast…..Sorry. I have several causes that I do donate my art work to. This year I have had five and luckily, haven’t had to turn down a cause because I thought it was silly or something that I can’t support ethically. In my heart, I have to feel that I am truly giving back to the community by giving/donating a piece to someone because, these days, there is little monetary funds for them to ask for. I even cancelled my $5 a month donation to Moveon.org. I do feel that I am maxed out in terms of donations at this time so if you think this is a good time to give me a call, you might want to reconsider that…..just sayin’. Friends of the North Fork of the Shenandoah River. This is the organization that I helped brand and spent about 10 years volunteering with them as a river monitor, benthic monitor, webmaster, helping with fundraising and yes, donating my artwork for them to auction off. I even became one of the people that went to other artists and asked them to donate to the cause. This is the organization that I have to thank for the support that they, in turn, have given me and helped to get my name out into the community so that I can do what I am doing now. Thank YOU, FNFSR! Shenandoah Alliance for Shelter. 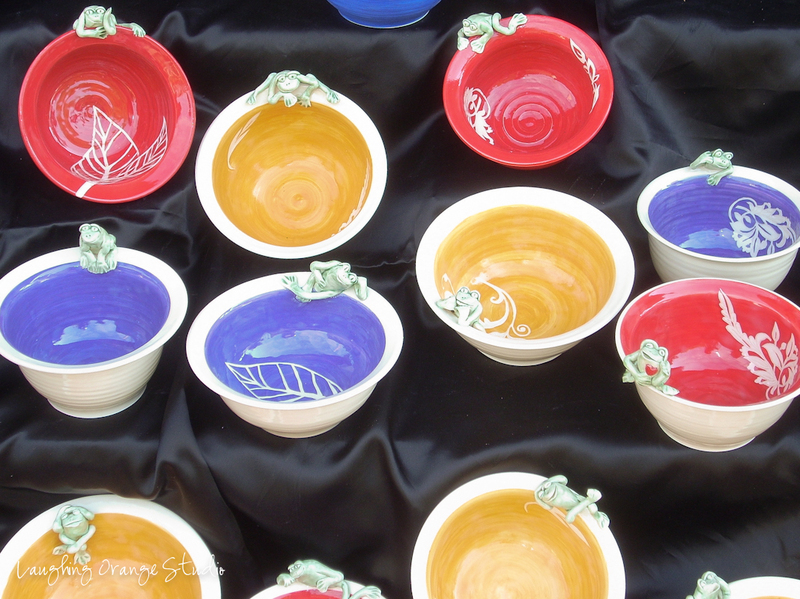 When I decided to become a full time potter, I was asked by Kary Haun to donate to the Alliance’s Empty Bowl Supper. The first year, I think, I donated 24 bowls. Now, you need to know, the Shenandoah Alliance does compensate the potters $6 per bowl to cover the materials but the time spent creating the bowls are given by the individual potters. This will be my third year doing this and I really love this event. The shelter’s mission is to provide help for the homeless. Unlike many cities, where homelessness is very visible, our rural area still has this problem. This shelter gives temporary shelter to these individuals or families so that they are taken care of. Habitat for Humanity. I have always felt that this is a worthy cause, even though it is christian based. How cool is it when a group of local people come together, as a community and build a house for someone that qualifies for it. The homeowner isn’t given the house but has to meet qualifications and be able to repay the loan, just like the rest of us. They are required to give “sweat equity” as their downpayment so this is proof, to me anyway, that I can also give some sweat equity and help them get into their new home, knowing that they are a hard worker too. AIDS Response. This event was to help in the fight against HIV/AIDS and help those persons with their medical needs that might not be available through another source. Since our society is becoming more tolerant of the gay lifestyle, there is still a stigma surrounding it and yet the expense, like many illnesses, add a burden that I believe we, as a community, can help with. Shenandoah’s Response Shelter for Abuse. Given that I have seen first hand, abuse to women is not something that should be taken lightly. My mother put herself into abusive relationships and had all the symptoms of how women deal with these types of situations. With the economy and funding being cut to these programs, both on a national and local level, I feel this is one that I also have to try and help out. So, as an artist, who by this time of year, is pretty much done with my donations, I have to say that, donating to a cause is a good thing. If someone approaches me to do free work or discounted work, I am learning that I need to ask for money for the work. I have bills to pay just like everyone else. My art is personal and is for me. It is not something I can do to suit someone else who thinks I need to make what they think will sell best. I need to be the one to make those decisions but I also need to eat. I also believe that our society needs to think more about where items come from. The mug or bowl that I make isn’t from China. If, for all those years, we had been paying someone like myself, in our own communities or, within a 100 mile radius of our homes, prices for hand made items might not feel so high. I believe that by building communities and trying, (notice, I said, trying) to leave our beliefs out, that we can come together and do a lot of good for ourselves and our planet. I just believe that is the right thing to do. What are your thoughts? Here are some links for some additional reading on this topic.